Welcome to Eagle Woodworking. 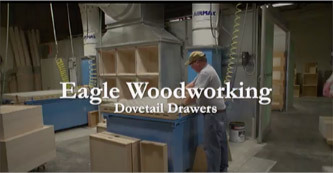 For over 35 years we have partnered with cabinetmakers and woodworkers throughout the United States, who trust us to create and deliver the finest quality custom dovetail drawers. We have built our reputation one customer at a time. Our passion for quality dovetails with the beauty of our drawers. Please call 978-681-6194 or email us for more information. Use our convenient order form to request a quote or place an order. Our custom dovetail drawers are made to your exact specifications.